Great for indoors or out, our fold away slide is excellent for tight spaces. 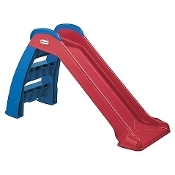 The wavy slide design adds to the excitement and overall play experience. For children 1-4 years. 39"H x 18"W x 23"L. Slide is 38" long. Colors and styles may vary.